Nancy Kress was born and raised in upstate New York, where she spent most of her childhood either reading or playing in the woods. She earned a bachelor's and master's degree in education, as well as an M.A. in English. While she was pregnant with the second of her two sons, she started writing fiction. She had never planned on becoming a writer, but staying at home full-time with infants left her time to experiment. In 1990 she went full-time as an SF writer. The first thing she wrote in this new status was the novella version of Beggars In Spain, which won both the Hugo and the Nebula Award. 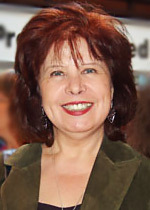 She is the author of more than twenty books, including more than a dozen novels of science fiction and fantasy, as well as three story collections, and two books on writing. Of her most recent novels, Probability Space (Tor, 2002) won the John W. Campbell Award for Best SF novel. Her short fiction has appeared in all the usual places, garnering her one Hugo and three Nebula Awards. Her work has been translated into Swedish, French, German, Italian, Spanish, Polish, Japanese, Croatian, Lithuanian, Romanian, Greek, Hebrew, and Russian. She is also the monthly "Fiction" columnist for Writer's Digest Magazine and she teaches writing regularly at various places, including Clarion and The Writing Center in Bethesda, Maryland. She currently resides in Rochester, New York.